The Indiana Library Federation connected library personnel for two days in November. The conference theme was “Strengthening Connections: Your Key to Success.” The keynote speaker, author Daniel Handler, emphasized his connections where he related his past experience reading local newspapers, and curiously reading unusual stories that may or may not be a lesson to the reader. The results are Daniel Handler’s Lemony Snicket stories, a “series of unfortunate events.” I give you a small sampling of fortunate events that started on Tuesday November 16, the first day of the conference. “Arguing for Aristotle: Connecting the Evolution of Small towns and the Future of Public Libraries” by Zachary Benedict reinforced my belief in libraries as public spaces to make people happy, to assist the public with their inward development, where quality civic space and a good life are experienced. It was not all philosophical. 80% of libraries are in small towns of less than 25,000 people. So like Greek and Roman public spaces, public libraries need to be well designed and well intended. This was followed by “We’re Not in Kansas Anymore” a panel of library directors and technical service person discussed the implementation of broadband technology in their library spaces. Discussion began with what each library has in terms of technology infrastructure, what obstacles there are to overcome (more than money alone), what success looks like, and where to go in the future. Wednesday, November 17, a packed room with a standing crowd enjoyed Laura Solomon presentation on “Absolutely Free (and Practically Unknown) Online Tools You Didn’t Know You Needed.” Some sites are for productivity but she closed the presentation with http://www.omnomnomify.com, an Internet tool to Cookie Monster your web pages. All of us need sites that can assist us in handling information but levity is good, too. Participants laughed at themselves, recalled memories and experiences, and look to the coming year to implement what was learned in our conference connections. 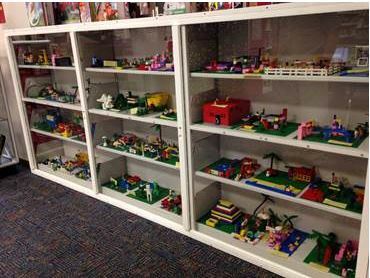 This blog post was written by Karen Ainslie, Library Development Librarian and Professional Development Office Librarian. For more information, contact the Library Development Office at (317) 232-3697 or email statewideservices@library.in.gov. 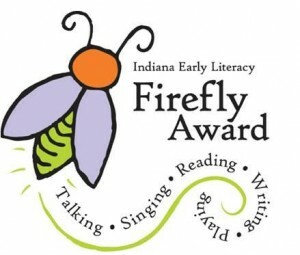 The Indiana Early Literacy Firefly Award is an initiative of the Indiana Center for the Book. 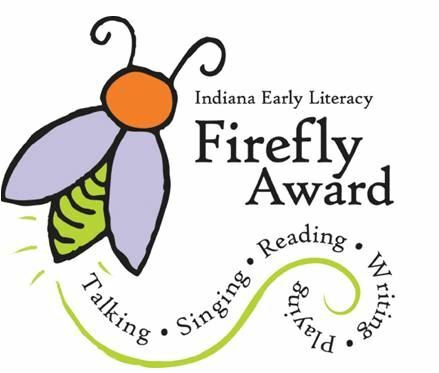 This state award, administered by the Indiana Early Literacy Firefly Committee, highlights picture books for young children. Picture books serve an important role in the first years of the life of a child. The purpose of this award is to encourage parents, caregivers, and very young children to interact together with exceptional picture books. 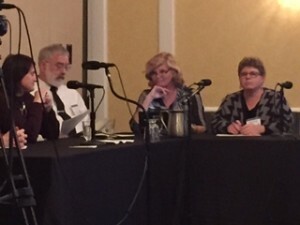 I field questions from my region’s librarians and act as a liaison between them and the Indiana State Library. Similar to a typical Reference desk, I get all sorts of questions: from Centennial celebrations to how to work on a WordPress website. With every question that comes my way I learn something new, so keep the questions coming!! The 2015 ALA annual conference #alaaac15 has come and gone and it was another memorable one for the books – literally and figuratively. If you have ever experienced this conference before, you know that some of the battle is getting back home without picking up too many Advanced Readers Copies of books. For bibliomaniacs everywhere, the struggle is real. I try to resist, having purposefully packed only a small carry-on, yet alas ended up shipping 2 boxes of books back anyway. Yay, books! I was fortunate to be able to garner support and go to the annual conference this year, only having a few months under my belt as Children’s Services Consultant at the Indiana State Library. With a new city to navigate and different sessions from which to learn, it’s definitely a whirlwind and one you have to plan ahead of time. The ALA conference website has a nice online scheduler to assist you with jam-packing your days with high-conflict/high-priority sessions. Whee! Most times, though you’ve planned, you still roll with the punches – seeing how you feel (“I need coffee!”) and where you are actually located to see if it’s feasible to attend the session you wished. And, of course, you HAVE to compare your session times against all the great author signings in the exhibit halls. You can locate these titles by a couple of different ways: You can use the Advanced Search feature to search by journal title by selecting SO Journal title/source from the drop-down menu or you can search by International Standard Serial Number (ISSN) by selecting IS ISSN from the menu. You also can achieve the same results by doing a Publication Title Search from the top menu option. Additionally, keyword and subject searches can direct you towards full-text articles from other publications. If a full-text option isn’t available for a title you want, remember that you usually can obtain a copy of the article via interlibrary loan. 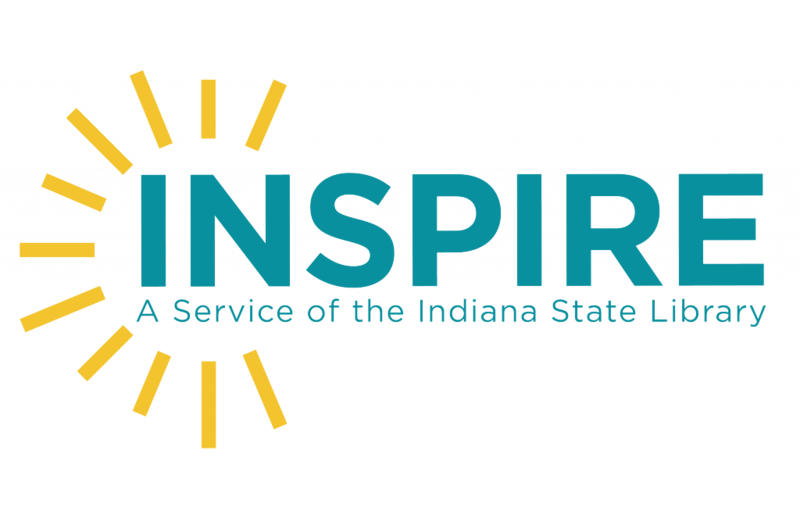 As always, INSPIRE.in.gov is absolutely FREE to all Indiana residents so take advantage of this resource and keep your cataloging knowledge up-to-date! Starting in early July, 237 Indiana public libraries plan a budget. This will tell how the library spends money in the next calendar year. Library expenses are for services such as staff, materials, facilities and technology. These services are determined by the library community goals as outlined in their strategic plan. Libraries in Indiana can levy a tax that results in revenue from property tax; the other money is received from miscellaneous tax such as sales tax, some local income tax, and revenue the library generates itself through fines and fees. There are two authorities that oversee the library and its budget plan: the library board, and The Department of Local Government Finance (DLGF), a state agency. Each year the budget can grow according to a growth quotient, a number that is calculated from federal data based on the growth of personal income. The DLGF issues the growth quotient and the library board calculates the budget with input from library director. The budget estimate with the calculation results in a levy and a tax. 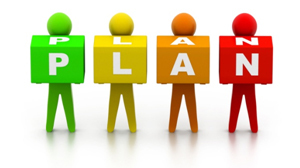 The budget approval process follows the budget calendar. First the public is given notice through two advertisements in September, then a public hearing is held for the plans approval by the library board. After approval, the plan is submitted to the DLGF by November 2. The budget order is issued in the New Year by the DLGF. The public can see library budgets on the public side of the Budget Gateway found here https://gateway.ifionline.org/default.aspx. Click on the link to view local budgets. Then select report, for example, select “Budget Estimate-Financial Statement-Tax Rate.” On this page you make several selections. Choose a county, unit (library) and the name of the unit. You can choose from the fund types available to see the budgets. The report gives the total budget estimate, the tax rate and the tax levy. The public libraries work as good stewards to safeguard the money, monitor the cash flow, and provide the community with excellent library services. For more information, view an eight minute video on “Public Library Budgeting in Indiana” found on the webpage http://www.in.gov/library/5416.htm. This presentation is a budget primer for library staff and patrons. Professional development is an important part of librarianship, so that librarians can keep up with innovations within the profession and thus provide the best possible service to the public. This is particularly important in specialized subject such as genealogy. 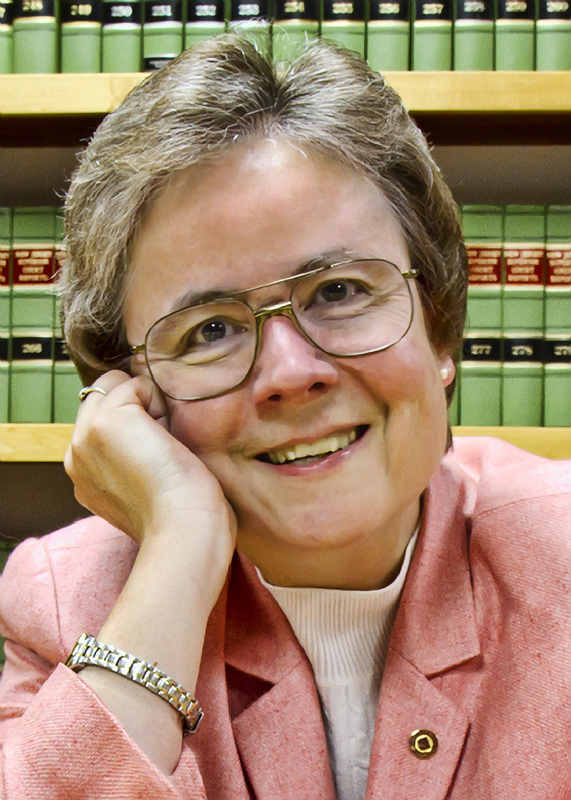 With that in mind, two librarians from the Genealogy Division of the Indiana State Library attended the Indiana Genealogical Society’s (IGS) annual conference at Indiana State University earlier this year, where they attended several presentations by Judy Russell, author of the popular blog The Legal Genealogist. Russell’s lectures were both informative and entertaining. She spoke on visiting county courthouses for genealogical research in original county records, finding ancestors’ military and military pension records and the abundant genealogical information they can contain, and tracking our “black sheep” ancestors using court and prison records as well as other contemporary sources, such as newspaper articles. 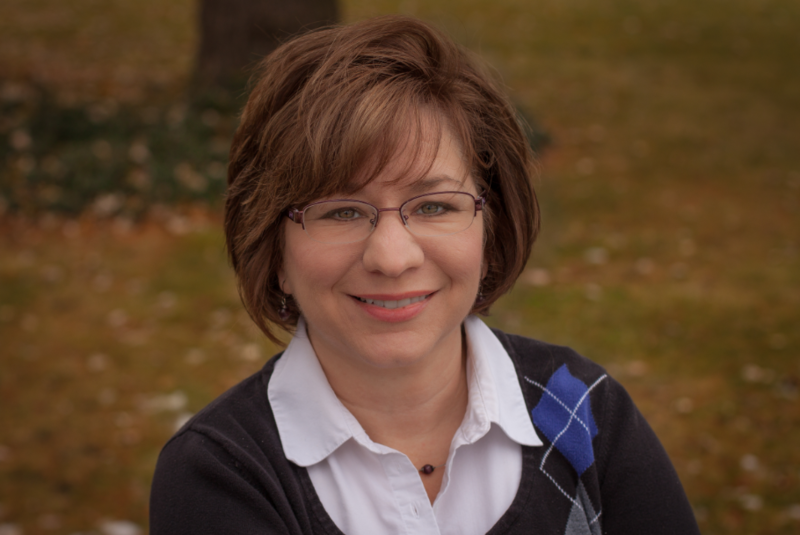 If you were unable to attend the IGS conference or if you would like to hear Judy Russell again, she will be speaking at the annual Genealogy and Local History Fair held at the Indiana State Library on October 24, 2015. Russell will be speaking on research methods for finding your “black sheep” ancestors and utilizing underused collections, such as prison records, to further that research. This free event is open to the public and registration is not required. For those in the library or legal professions, these sessions have been approved for LEUs and CLEs. Preserving collections, whether they are your small collection of family photos and documents or a large library, can seem both daunting and potentially expensive. Yes, hiring a Conservator, purchasing ‘archival’ quality preservation housing materials (like boxes, envelopes, sleeves, and folders), and acquiring all of the equipment necessary for an on-site Conservation Lab are all major investments, but there are also small things everyone can do *for free* to prolong the life of their materials. Also, avoid stacking books too high, carrying too many at once, or attempting to lift a book that is too heavy for your ability, as a lot of damage can occur from a book falling to a floor. While you might think it looks nice or perhaps you were paging books in a hurry, leaning books cause a lot of damage. When the textblock is skewed in this way it will lose its integrity and possibly break into sections. The case (the covers and spine of the book) is also likely to incur damage at the joints, especially if the covering material is an older, fragile cloth or leather. If you need to store a book on its side, never place the book with the fore-edge down. It is very tempting to do, because then the call number and/or title is more visible, but the weight of the textblock will eventually pull the book away from its covers and/or break or warp the textblock entirely. So even though it is more inconvenient, always store them spine-side downward (or plan to repair your book much sooner and more often). Be considerate to older bindings – Don’t force open a tight binding, and make sure if a book is fragile you give it some extra support to open it safely. Only write in books if necessary, and only use pencil. 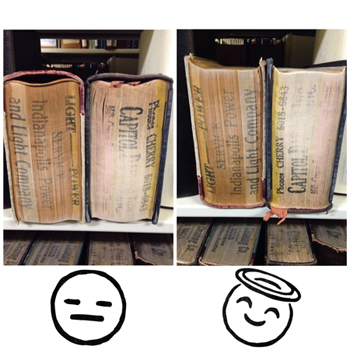 This blog post was written by Rebecca Shindel, Conservator, Indiana State Library. For more information, contact the Indiana State Library at 317-232-3675 or “Ask-A-Librarian” at http://www.in.gov/library/ask.htm.